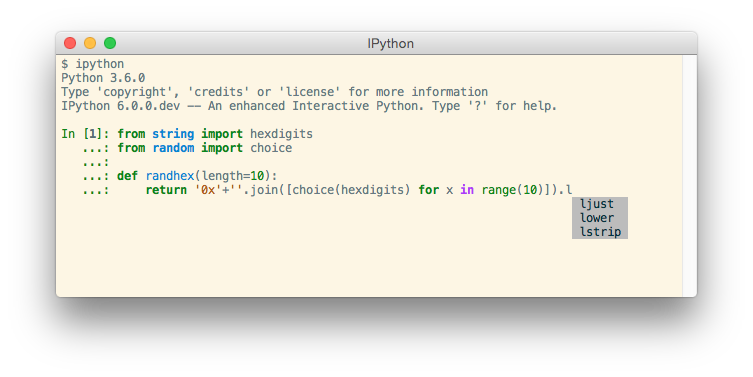 This documentation covers a development version of IPython. The development version may differ significantly from the latest stable release. A Jupyter kernel to work with Python code in Jupyter notebooks and other interactive frontends. Input history, persistent across sessions. Caching of output results during a session with automatically generated references. Extensible tab completion, with support by default for completion of python variables and keywords, filenames and function keywords. Extensible system of ‘magic’ commands for controlling the environment and performing many tasks related to IPython or the operating system. A rich configuration system with easy switching between different setups (simpler than changing $PYTHONSTARTUP environment variables every time). Extensible syntax processing for special purpose situations. Access to the system shell with user-extensible alias system. Easily embeddable in other Python programs and GUIs. Integrated access to the pdb debugger and the Python profiler. real multi-line editing thanks to prompt_toolkit. integration with command line editor for a better workflow. the object to create a rich display of Html, Images, Latex, Sound and Video. interactive widgets with the use of the ipywidgets package. This documentation will walk you through most of the features of the IPython command line and kernel, as well as describe the internal mechanisms in order to improve your Python workflow. You can find the table of content for this documentation in the left sidebar, allowing you to come back to previous sections or skip ahead, if needed. The latest development version is always available from IPython’s GitHub repository. The Jupyter documentation provides information about the Notebook code and other Jupyter sub-projects. © Copyright The IPython Development Team Revision b8074a4a.